What is an Energy Star Dehumidifier? SaniDry™ Dehumidifier is Energy Star rated - a rare achievement for a dehumidification system. You'll also never have to empty any buckets on your SaniDry™ system because it automatically drains into your WaterGuard® basement waterproofing system or sump. Having a groundwater-free basement is one thing. Adding a SaniDry™ is like putting the cherry on top of your dry basement program. It makes it complete. I haven't seen many basements that don't need one. Picture the concrete in your basement turning white because it is so dry! How does it perform so incredibly well with the same amount of energy that less-effective 20-pound-weakling dehumidifiers use? The SaniDry™ blows air over a huge cold coil. It looks like a truck radiator instead of the little squirrely spiral coil of dinky dehumidifiers. The SaniDry™ runs the exiting dry cold air through a special heat-exchange core that pre-cools the incoming wet air and recaptures energy. The SaniDry™'s powerful 200 cfm blower not only grabs more air in order to dry faster, but also moves the dry air out around your basement to dry the contents of your basement. There are other component reasons SaniDry™ wins the dehumidifier battle, but these are the main ones. To further prove its mettle, SaniDry™ is Energy Star rated - a rare achievement for a dehumidification system. Another big benefit of the SaniDry™ system is that it doesn't have to be located in the space it's drying. 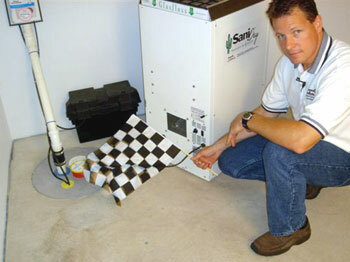 You can locate it in a utility room and duct the wet air in and dry air out to the main room of your basement. With no water leaks and dry air, materials stay dry and you can finish your basement or use it for storage. No smell, no mold, no property damage.